This is a clever little joke passed to me from a good Franciscan priest friend of mine here in Jerusalem. Catholics need good jokes and this is one we can add to our collection. One day while he was at the track playing the ponies and all but losing his shirt, Mitch, a Protestant noticed a Catholic priest who stepped out onto the track and blessed the forehead of one of the horses lining up for the 4th race. 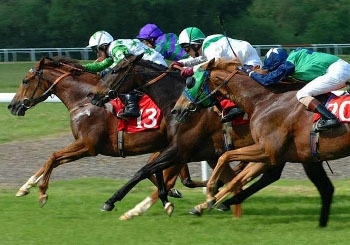 Lo and behold, that horse – a very long shot – won the race. Before the next race, as the horses began lining up, Mitch watched with interest the old priest step onto the track. Sure enough, before the 5th race the horses came to the starting gate. The priest made a blessing on the forehead of one of the horses. Mitch made a beeline for a betting window and placed a small bet on the horse blessed by the priest. Again, even though it was another long shot, the horse the priest had blessed won the race. Mitch collected his winnings, and anxiously waited to see which horse the priest would bless for the 6th race. The priest again blessed a horse. Mitch bet big on it, and it won. Mitch was elated. As the races continued the priest kept blessing long shot horses, and each one ended up coming in first. Bye and bye, Mitch was pulling in some serious money. By the last race, he knew his wildest dreams were going to come true. He made a quick dash to the ATM, withdrew all his savings, and awaited the priest's blessing that would tell him which horse to bet on. True to his pattern, the priest stepped onto the track for the last race and blessed the forehead of an old nag that was the longest shot of the day. Mitch also observed the priest blessing the eyes, ears, and hooves of the old nag. Mitch knew he had a winner and bet every cent he owned on the old nag. He then watched dumbfounded as the old nag come in dead last and then dropped dead. Mitch, in a state of shock, made his way down to the track area where the priest was. Confronting the old priest he demanded, 'Father! What happened? All day long you blessed horses and they all won. Then in the last race, the horse you blessed lost by a Kentucky mile. Now, thanks to you I've lost every cent of my savings – all of it! '.